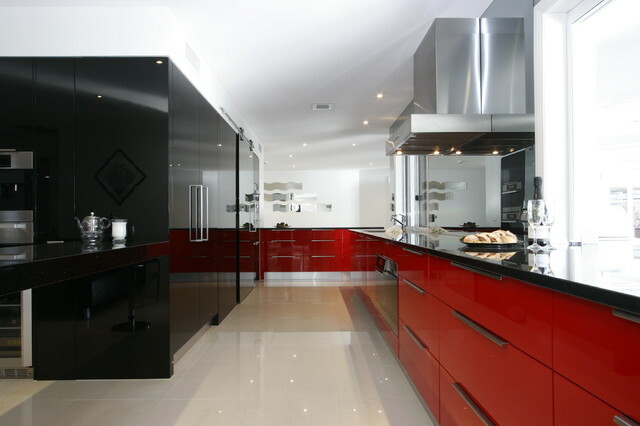 Galley kitchen, Gloss ‘Enigma Red’ 2 pak feature doors. Front- Black Gloss Createc, pantry shelves & cabinets in Charcoal Melamine. Premium 30mm Black Galaxy Granite bench tops. Pantry in dark gloss laminate. Sliding pantry door system Kethy ‘Exterus’ and Mirastar glass pantry door with large 2 way handle. Luxury continues to custom made outdoor kitchen area. Galley glamourEven in a galley kitchen, dark tones can work as a star attraction. Here, opposites attract with Createc black gloss cupboards and two-pack gloss doors in ‘Enigma Red’ adding glamour to the space. For continuity, the moody Galaxy Granite benchtop was the final touch, all designed by the Brisbane firm, Enigma Interiors. Disadvantages of high glossDue to the fact that cabinets with a high-gloss finish reflect so much light, fingerprints, dirt and scratches are much more noticeable on them than they are on matt or semi-gloss cabinets. (But as I mentioned, they are very easy to clean so this may not be an issue for you. )The disadvantage of a dark colour in a gloss finish is that any tiny imperfections on the surface of the doors, such as scratches or finger marks, are much more noticeable than they are on lighter colour gloss doors. You might want to steer clear of darker colours if you have young children or are concerned about having to clean the cabinet fronts more regularly than you would like.